Women's lightweight running trainers from Ash. Crafted with flexible, multi-knit uppers, the 'Lucky' sneakers feature a classic lace-up fastening and a leather panel to the heel. Set upon a durable rubber sole with Ash branding. Further branding to the tongue and collar. Upper: Textile/Leather. Lining: Neoprene. Sole: Rubber. Black knitted runner trainers from Ash. Crafted from breathable mesh uppers, the 'Lucky' sneakers combine a sporty low top profile with appliqué metallic star motifs for a feminine, on-trend aesthetic. The padded collar with contrast leather panelling and full lace up fastening ensure a secure, comfortable fit. Set upon a cushioned, contrast rubber sole with air-bubble and treaded grip. Finished with embossed Ash branding at the heel and a brand tab to the tongue. Supplied with additional set of laces. Upper: Textile. Sole: Rubber. ‘Magma’ knitted running trainers from Ash. 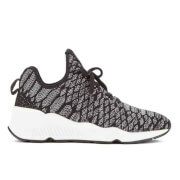 Crafted from a lurex knit upper with a metallic woven snake print design, the sports-luxe sneakers comprise a lace up fastening and a high rise ankle silhouette with padding for additional support. Set upon an ultra-light embossed rubber sole with a subtle wedge platform. Complete with a heel pull tab and Ash branding to the tongue. Upper: Lurex. Sole: Rubber. ‘Miko’ shearling lined ankle boots from Ash. Constructed from premium suede uppers with a subtle shimmer coating, the boots perfectly merge functionality with sports-luxe inspired styling. Fully lined in cosy shearling and set upon a contrast rubber sole with a low platform for a modern edge. Fastened with an interior zip and complete with Ash branding to the heel. Platform Height: 2” Upper: Suede. Lining: Shearling. Sole: Rubber. Women's suede ankle boots from Ash. Crafted from supple suede with soft shearling lining, the 'Mitsouko' winter boots feature a rounded toe with scalloped, moccasin-style trim, elasticated lace-up fastening with adjustable toggle, and a branded pull tab to the heel for entry assistance. Set upon an ombré-effect, architectural sole for enhanced cushion and grip. Complete with branded patch to the heel. Upper: Suede. Lining: Shearling. Sole: Rubber. White leather trainers with contemporary stud detailing from Ash. Crafted from smooth leather uppers, the low top sneakers comprise a padded collar, partial lace-up fastening and rounded toe. Set upon a contrast rubber sole with diamond embossed feature to the heel. Embellished with gold-toned pyramid studs to the tongue and side panels. Finished with Ash branding. Upper: Leather. Sole: Rubber. 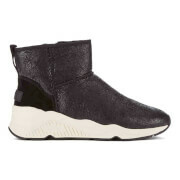 Women's 'Thelma' hi top wedged trainers from Ash with premium leather uppers. Accentuated with multiple buckled straps to the front and heel counter, the wedges feature a rounded toe and side zip fastening for easy access. Set upon a 4 inch rubber sole with contrasting striped detail to create a sporty aesthetic. Complete with branding and signature distressed marks on sole and toe. Upper: Leather. Sole: Rubber. Heel Height: 4 (approx.) Please Note: Ash 'Thelma' trainers have a generous fit. If you are between sizes, we advise you to buy a size smaller than you normally would for the perfect fit.